You’ve all heard of a ‘magic eight-ball’ – now prepare to see what magic the number eight is really capable of. …all using a single intelligent device and all via a free missed call or SMS text message from your phone. It doesn’t get much better than that! In addition, the MyGSM 8I8O offers eight inputs that can be used to monitor up to eight different electrical devicesusing a single module. Up to 10 users per input can all receive SMS notifications whenever any of the eight inputs are activated; for example when mains power fails, an alarm is triggered, the infrared beams at your gate are interrupted, etc. The functionality of the 8I8O is only limited by your imagination! Here’s a neat trick: press the call button on your phone and watch the world transform into a fully automated future-scape over which you have total control. If you have the MyGSM 8I8O installed, that is! Eight outputs allow you to control eight different electrical devices, and you’ll receive SMS notifications right to your phone whenever any or all of the eight inputs are triggered. Did someone call for backup? Because with the MyGSM 808I, that’s exactly what you get thanks to a second SIM card slot. If the primary SIM fails to find a network signal, the unit will automatically – and intelligently – switch over to the secondary SIM. There are virtually no limits when it comes to what you can control and monitor with your MyGSM 8I8O GSM module, so why should you be limited in what power supply you use? You shouldn’t – and that’s why we’ve given this unit a wide 12 – 24V DC input voltage range. Monitoring electricity and water levels are just two of the infinitely useful applications that the MyGSM 8I8O can be used for, so we’ve made sure that it’s dead easy to use the module in these industrial settings. This we did by fitting the enclosure with robust mounting brackets that can be effortlessly clipped onto DIN-rails such as the ones found in distributions boards, pump houses, etc. There’s no need to waste precious time disconnecting and reconnecting wires – and getting confused about which wire goes where in the process – when you need to move or replace a module. Simply unplug the removable terminal strips, do your thing, and plug them back in! If the MyGSM 8I8O had a middle name, “convenient” would be it. You have total freedom when it comes to how you set your module up. The MyGSM 8I8O can be configured via an SMS command, from the incredibly user-friendly and secure web portal or even using your PC or laptop’s USB port. Using any or all of these methods, you can add, edit and delete users, edit output settings and much more! With a 5000 user memory capacity, the MyGSM range is very much at home installed at large townhouse complexes, factories, estates…or any commercial or industrial setting. Want to know how strong the network signal is in the area? With the MyGSM 8180, all you have to do is ask! Pressing the onboard test button will display the current signal strength of the module via a series of clearly visible LEDs, so there’s no need to waste an SMS to query it. Set an access number to only be valid for as long as it needs to be – be it a day, a week or a month – ideal for controlling visitor access in a Bed and Breakfast environment or for letting armed response or maintenance personnel in and out. Peace of mind is part of the package with the MyGSM 8I8O GSM unit. Only the master administrator has the power to learn in numbers or change settings, so you know that your security is never compromised. One input = two states! Thanks to the inputs having both rising and falling edge capabilities, a single input can notify you when your power goes off AND when it comes back on! 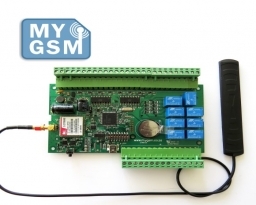 There’s no wasting inputs with the MyGSM 8I8O! The inputs are optically isolated, which means that you can monitor devices using different power supplies without having to fit time-consuming and confusing wire links. Nothing’s going to break this product’s stride. This sort of circuit board design also lends an incredible degree of protection to the electronics. The MyGSM’s outputs can be configured to react to missed calls, SMSs or even a Please Call Me, so no matter what your airtime situation this unit will always heed your call. The MyGSM module’s antenna screws onto the PC board – and unscrews just as easily – so you can comfortably position it without worrying that it’s going to break off in your hands.